20 December 2012, Rennes, France - On Friday, 14 December, worldwide hospitality exchange network BeWelcome released a major update to their website www.bewelcome.org, dropping Google Maps as default map provider in favor of free and open source OpenStreetMap. BeWelcome decided to make the switch because thanks to thousands of individual contributors OpenStreetMap mapping material has greatly improved over the last years, and because implementation through third party services has become painless. With this step volunteer-run BeWelcome also underlines its strong non-profit values - in a time where internet-based "peer-to-peer hospitality" communities are subject to increasing commercialization by venture capitalists. When BeWelcome was launched in 2007 all mapping features were implemented using Google Maps, the only free up-to-date maps with search and embedding capabilities available back then. Over time, and also with contributions by BeWelcome members themselves, the free alternative OpenStreetMap (OSM) matured and other websites switched over from proprietary services. In some parts of Russia or Bosnia for example OSM even offers more detailed maps than commercial alternatives. So when BeWelcome was approached by an OSM spokesperson in Germany earlier this year, the topic was discussed in the community and the switch was made a priority, additionally fueled by the fact that Google introduced a pricing model and ads for its maps service. A few weeks later one BeWelcome software developer presented an almost complete integration of OSM based on the free Cloudmade/Leaflet API. His work was then extended by a team, recently included in the main development environment and finally launched to the live website. "With the switch we are getting closer to becoming completely independent from using commercial services. I am convinced that our users will appreciate our commitment to privacy and non-profit projects." says founding member and active volunteer Matthias Hess. Meinhard Benn, technical coordinator and programmer at BeWelcome notes: "OpenStreetMap is all about people and their passion for sharing, just like us. So it's a perfect match." He adds: "Google Maps will remain an optional layer for the time being, but depending on user feedback we will either ditch it completely or at least allow users to choose alternative commercial map providers to have less of a mono-culture." Frank Van Den Block, chairman of BeWelcome's legal body BeVolunteer confirms: "The switch to OSM is a logical next step in the evolution of BeWelcome. Nothing beats a map created by thousands of individuals and constantly updated by dedicated volunteers. Open Source means freedom, and that is something we can never have enough of." BeWelcome is a hospitality exchange network - a worldwide community that lets you share your home or a place to stay for a few nights, make new friends from different cultures and help others on their way. In contrast to similar commercial networks, BeWelcome is a registered non-profit that places value on open source and contributions made by their members. BeWelcome has created a legal and organizational framework which ensures that it will always remain non-profit, open and free. Every member is encouraged to help guide the community, participate in core decision-making and contribute to the development of the website. Thanks to the hard work of an expanding team of contributors, BeWelcome has grown from a small project with a handful of members in 2007 into a vibrant and enthusiastic community. 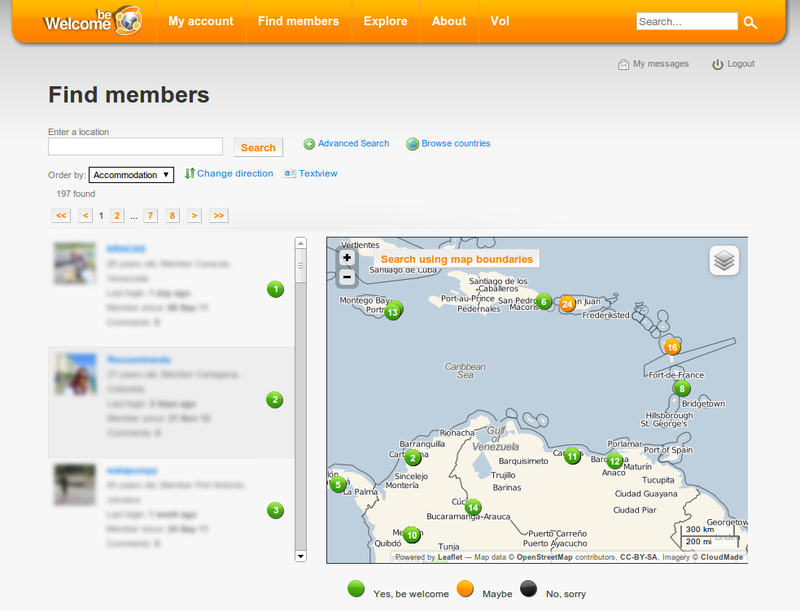 Its membership base has more than doubled in 2012, now comprising 30,000 registered hosts and travelers. It is an organic self-managed organization without the need for investors, stockholders or venture capital. Everyone passionate about alternative travel, cultural exchange, making new friends, and sharing experiences with like-minded people in every corner of the world will feel right at home in the BeWelcome community. BeWelcome plans to continuously improve its service and innovate new ways of serving its cause. There are a few more smaller changes and improvements. Read more details in the complete changelog, if you are interested. With this release we are taking another step towards supporting the non-profit world by including work from other volunteer-run projects into our site. We feel this is worth a press release, which will be sent out shortly. Stay tuned. Thanks fly out to abyssin, beatnickgr, crumbking, lantti, James_Oder_Dave, jsfan, mahoun200000, matthias, midsch, pablobd, sanderr, shevek and toub for making this release possible by testing, commenting and contributing code. We would also like to thank Cloudmade for supplying their fantastic free API service to embed OpenStreetMap material into any website. Let us know what you think about these changes in the comments below! There are a few more changes and plenty of technical details in the complete changelog. Thanks to crumbking, jsfan, mahouni200000, matthias, sitarane, tobixen and toub for helping with this release by contributing code, bug reporting, commenting and testing. Read all the background and discussion in the 10 tickets mentioned in the detailed changelog. Firstly, when viewing your own profile, you also see "Edit" links on the groups, comments and pictures boxes although you can't directly edit things on the following pages. Should we rename the link to "Manage" there, or is this clear as it is? Secondly, the "Family and close friends" list had no limit anyway, that's why we removed the "Show more" link. This means the box currently always shows all friends, which is already a very long list for some members (bonjour du Sud de la France). Should we limit this box to 3, 5, 10 or more friends, or even let you set this in your preferences? Please write your opinion in the comments below! See the detailed changelog for some technical background and 10 more smaller changes and developer related improvements. For the next release we have not set tasks or a focus yet, so please tell us in the comments below what you think is most important to be fixed next!